Assembled and Calibrated ROBO 3D R1 Plus 3D printer includes all new linear motion and lead screws for better quality, performance, and consistency. Also includes a better filament feeding system for ease of use. Additional components for leveling, guidance, and performance of the R1 Plus make it the best option for desktop 3D Printing today. You will love it. At the top of the industry in size of build platform, the R1 Plus 3D Printer is set at just close to 10" x 9" x 8" build volume, or 720 cubic inches of build space. Print bigger, and better. That's one of the biggest build volumes for a sub $1000 3D printer. We know that 3D printing is not all about gizmos, gadgets, and trinkets, it is about creating things, big or small. We do just that. ROBO 3D is now offering 24/7 phone support to make sure our customers are taken care of at all times including the ability to scheduling a 1 on 1 repair session with a technician via Skype video. Please call us at 1 (844) 476-2633 for any support questions. We want to make sure our customers are taken care of and supported so they can continue ROBO 3D printing their way to success! If your product experiences any component issues within 6 months, we will gladly send new components to you along with a quick video to help you switch it out. We built the machine to be easy to replace things, however we don't expect the need to. Keep 3D printing and let us worry about any issues if they come up. It is our job to keep you printing so you can change the world! 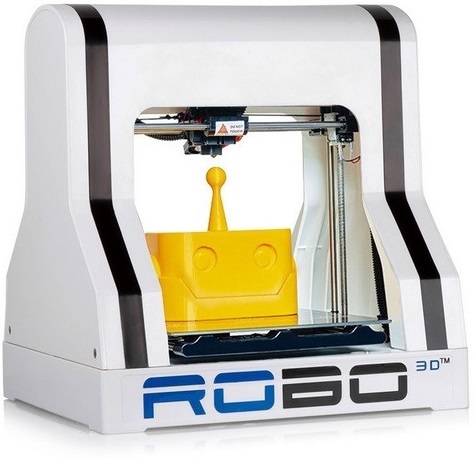 Your R1 +Plus ROBO 3D Printer is automatically set to a 9 point leveling system every time it starts a print. No longer have to worry about adjusting or leveling your bed manually. Get better 3D prints right when you plug in the machine for a long lasting time, EVERY time! Your new R1 +Plus ROBO 3D Printer comes installed with the brand new Hexagon All Metal Hot End that gives you the capability of printing with any material available. It goes up to 290c, which covers all materials in commercial circulation for 3D printing. Get more out of your 3D printer without overspending! The new R1 comes fully equipped with an SD card to allow you to print directly from an SD card so you no longer need to always be plugged into your printer via USB. Our software will soon be launching an update that will allow you to take full advantage of this feature, SEND AND PRINT FROM SD CARD. This will automatically allow you to send a file to your SD card and print it. Unplug the usb, and now you can print wireless. The new R1 ROBO 3D Printer easily reaches quality of 100 micron, much like that of machines that are thousands of dollars! Get a better priced machine like the R1 without sacrificing quality. It's as easy as clicking high quality in the software before printing and the machine will do the work. We want you to achieve precise results, therefore it is our job to make sure hardware, software, and firmware are aligned to give you high quality output. Our job is to help you print better without breaking the bank! Big Build Volume: 10" x 9" x 8"
With one of the biggest build volumes for a sub $1000 3D printer, you can be assured that BIG 3D printing is present on the R1 3D Printer. We know that 3D printing is not all about gizmos, gadgets, and trinkets, it is about creating things, big or small. It was our job to create a machine for you that could do all that. Our build volume is over double what the industry average is for desktop 3D printing machines, and at a fraction of the price!